What smells more comforting and alluring than fresh baked bread being baked and crisped in the oven? Honestly, little else. This bread smells incredible while baking and, even better, it’s simple, easy, and fun to make. 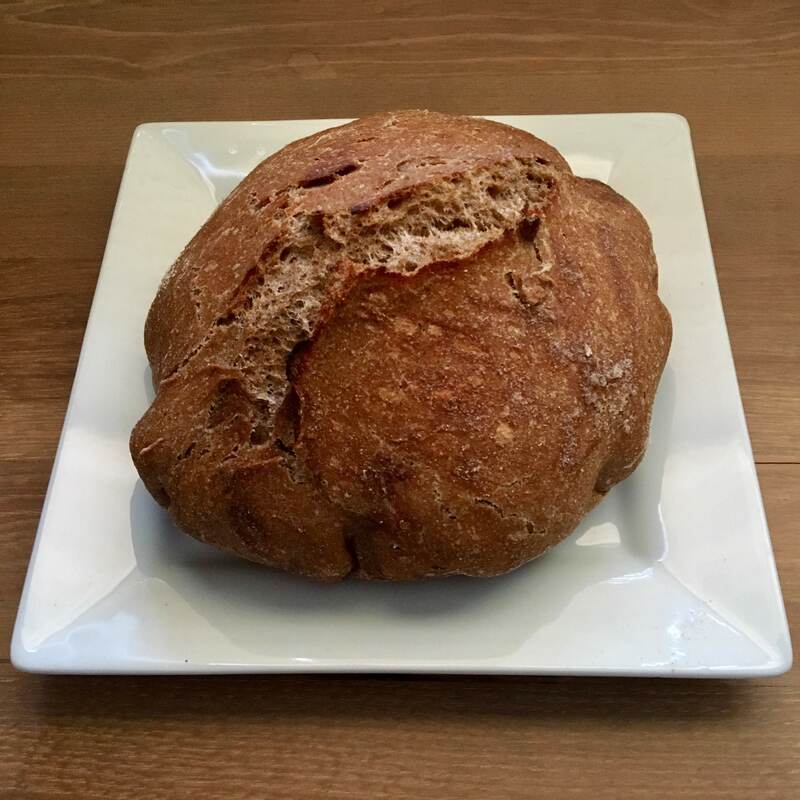 Even better, this bread retains all its natural fiber and minerals and is not laced with any of the stuff that goes into most “healthy” breads. No preservatives, no sugar, no oil, no fillers or softeners. It doesn’t need any of that! It’s absolutely perfect and delicious with its simple list of 4 ingredients and the magic of a dutch oven pot. Mmmmmm. When thinking of the next FitFrenchVegan recipe, I was checking the grocery list I share with Ryan, my partner in love and life. I noticed that “bread” had appeared on the list. We’d both been on a whole foods kick, so we hadn’t had bread in the house in a while. Which meant, I hadn’t baked one of my favorites in a while! I wasn’t about to have Ryan buying some sub-standard store-bought bread when I could easily and quickly make a delicious, healthy loaf in our own home. So, I got right to it! The result is a perfect sandwich bread, which Ryan promptly turned into vegan B.L.T.A.’s. The house smelled incredible and he was very happy with his lunch. This bread also pairs deliciously with all variations of peanut butter. Our favorite peanut butter these days is Trader Joe’s Crunchy without salt added. My favorite ways to enjoy peanut butter are with a little salt added (ha! but I like to be in control of it), with cinnamon added, or with homemade jam. Mmmmm! Or, you could turn it into a little pre-dinner treat. Your guests will surely be excited about homemade bread underneath their bruschetta or olive tapenade. It seems complicated, but it’s not. All you do is mix flour, water, salt, and dry active yeast. Let it rise overnight, pop it in a lidded pot, and boom! You’ve got the perfect loaf. This recipe is slightly modified in its instructions and based off of this recipe here on Jo Cooks. Jo’s recipe involves using LOTS of flour on the outside of the bread and aiming for a crispy outer crust. Ryan really doesn’t enjoy bread with a floury outer coating. We also both prefer soft bread. Maybe I’m doing it wrong, but I often cut the roof of my mouth on hard crusted bread. So, I went off to figure out how to make a bread that limited the floury outer coating and was soft and comforting. This took several iterations and loaves that seemed permanently fused to my pot. The benefit of flouring the outside of the loaf is that it limits sticking to the pot without the use of oil (win!). Instead, use some parchment paper as a barrier between the dough and the pot. However, you WILL need to use some flour (not much) to lightly coat the outer area of the bread so it doesn’t stick to the bowl or the parchment paper. The flour enables the bread to become a circular ball of dough. However, you only need about 1/4 cup sprinkled on a work surface and worked around the loaf. Use more if you’d like, but that should do it. I adjusted the instructions below to enable a softer loaf to develop. If you prefer a crunchier crust, check out Jo Cook’s post above for tips on ensuring that you get that crunchier exterior. Big plans are brewing for more bread recipes including one that is a traditional sourdough (wild yeast rather than dried, packaged yeast) and a rosemary-olive loaf. Keep your eyes open for those! The Lodge cast iron dutch oven pot I use is wonderful, but any lidded pot that is oven-safe up to 475 F degrees will work for you. The benefit of using cast iron is even heating throughout the entire pot and lid, ensuring even baking throughout the entire loaf. Also, as you can tell from my photos, I didn’t belabor the “shape into a ball” phase of the recipe. That part took me all of 3 seconds, but if you’d like, spend more time shaping and making it perfectly circular! This soft, healthy, 4-ingredient whole wheat bread will make you feel like you happened upon the easiest, best-kept secret for a healthy, sustaining , delicious staple in the home. Use it for sandwiches, breakfasts, and as an augment to salads and soups. In a mixing bowl, mix together flour, salt, and active yeast. Add water and stir together until well combined into a dough. Cover the dough with plastic wrap and leave it out on the countertop for 12-20 hours. After the rising period, preheat the oven to 475 F degrees. Put your cast iron/oven-safe pot into the oven with its lid on to warm while the oven preheats. Flour a clean work surface and roll your dough onto the surface. Use your hands to gently shape the dough into a round ball. Place the dough on a large sheet of parchment paper. Once the oven is preheated, remove the heated dutch oven and carefully transfer the dough and parchment paper into the warmed dutch oven. Add the lid and return the pot to the oven. Bake for 30 minutes. After 30 minutes, remove the dutch oven lid and bake uncovered for 5 minutes until outer crust is showing light traces of golden brown. Remove from oven and return the dutch oven lid onto the pot while the loaf cools. Leave the lid on for 10-20 minutes. The humidity of the warm loaf will help the crust to soften to your preference. Gently remove the loaf from the dutch oven using the parchment paper to lift it out of the pot. There may be condensation in the pot from the cooling period, which shouldn’t effect the loaf at all. Since this bread has no preservatives, I keep it in a sealed plastic bag in the fridge. Should keep for 5-7 days. Ensure your dry active yeast is not past its expiration date otherwise the bread won’t rise. My favorite whole wheat flours to use (prioritize those processed without bromide) are by King Arthur and Bob’s Red Mill brands.